Our product range includes a wide range of sauce pan, frying pan, aluminum tope and kadhai. Bestowed with an ingenious team of experienced professionals, we have been able to introduce an exclusive range of Sauce Pan. The unique design and quality provided on the pan offers great relaxation to the users. In addition, the provided pan is developed obtaining various sizes and styles. The given pan is developed using the quality materials adhering to set industrial norms under the guidance of the professionals. Our organization takes pleasure to introduce its business as one of the leading entity offering Frying Pan. This pan is used widely in hotels, restaurants, retro-bar and parties. The comfort design and quality laid on the pan provides immense relaxation to the users. Further, the offered pan is made up various sizes and styles. The given pan is manufactured using the quality materials adhering to set industrial norms. With the excellent support of our brilliant professionals, we are engaged in presenting Aluminum Tope. This tope is used widely in hotels, restaurants, retro-bar and parties. The comfort design, finish and stylish set offer an appealing feel to the party environment. The given tope is manufactured using the quality materials adhering to set industrial norms. Counted amongst the leading entities of this domain, we are betrothed in offering Kadhai. The given kadhai is fabricated utilizing the quality materials following the set industrial norms. 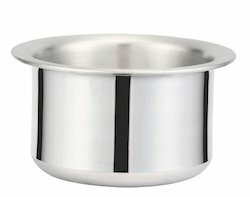 This kadhai is used widely in hotels, restaurants, retro-bar and parties. The comfort design, finish, and stylish kadhai offer an appealing feel to users. Apart from this, clients can avail the kadhai in bulk from us industry leading rates. Looking for “Kyyte Polish Cookware”?